Farmers across the country are being urged to take part in the Big Farmland Bird Count (BFBC), which starts on 8 February. 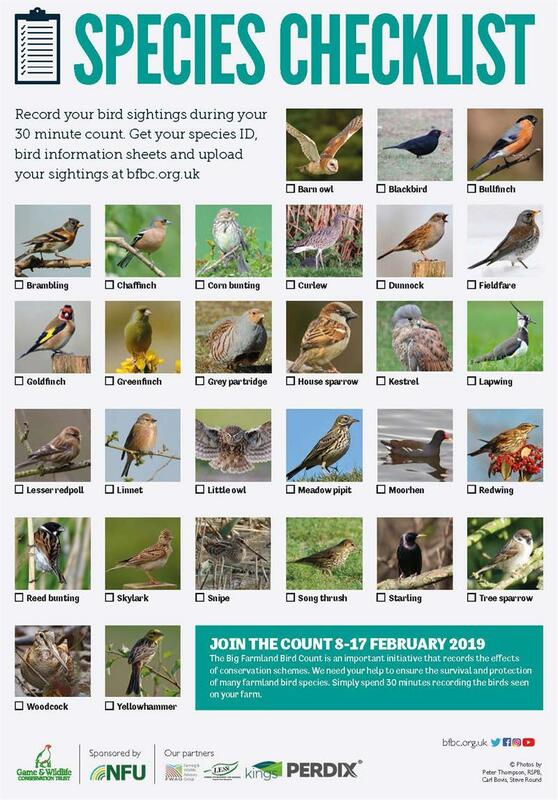 Sponsored by the NFU, the nationwide ‘citizen science’ project calls on farmers, land managers and gamekeepers to spend 30 minutes between 8 and 17 February recording bird species on their land. 2. Count your birds! On a day between 8 and 17 February, spend about 30 minutes recording the species and number of birds seen on one particular area of your farm. “The NFU is extremely pleased to be sponsoring the 2019 GWCT Big Farmland Bird Count. This event highlights perfectly how farmers balance excellent conservation work on farms across the country alongside producing the nation’s food." Yorkshire farmer Richard Bramley explains his passion for farmland birds including his favourite, the yellow wagtail. There are a few things you can do to help you identify birds on your farm. Take a pair of binoculars and a notepad and pencil and look for the distinctive things that individual species do that sets them apart. Jotting these details down will make identification much easier. Does the bird bob up and down or wag its tail? Does it stand in an upright position or lean forward? Does it have any distinctive features like a curved bill, a bright white stripe above the eye or spots on the breast? Where did you see it? Was it sitting on top of a bush or was it out in the middle of a field? Did it hop, walk or run? Was it on its own or was it part of a flock? Did it have a fast, straight flight or an undulating flight? Did it make any calls or sing?